Even though the beginning of the month heralded in the first day of spring in the southern hemisphere, the last week has felt far more like summer (except for a very uncharacteristic cold snap yesterday which caught a lot of us off guard), with temperatures climbing into the 40s!. The migratory birds have started to make their return back to the region with numerous sightings of Wahlberg’s Eagles, Red Breasted Swallows, Wood Sandpipers and a few others and as spring progresses we are still awaiting the return of the rest of them. The Birmingham males continue to roam the eastern parts of the reserve and have been seen in the company of the Ntsevu females on a number of occasions. 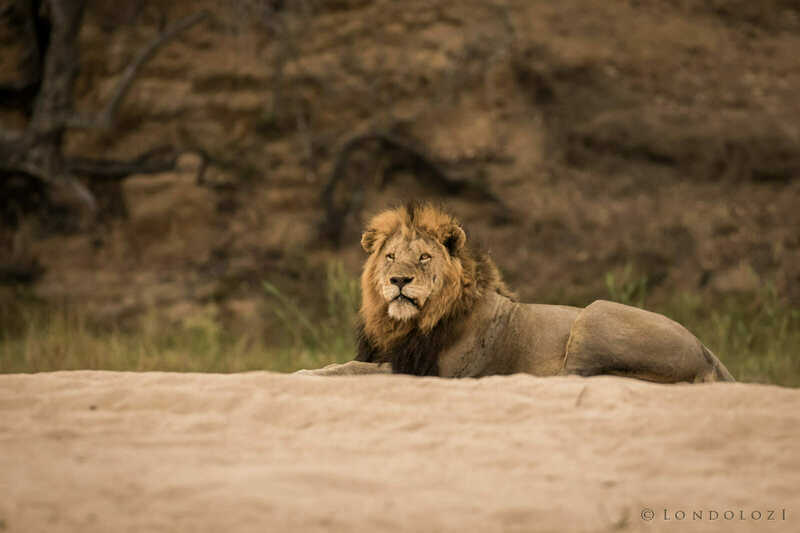 One of the males was seen yesterday mating with the Tsalala lioness and we are all quite intrigued to see if this lone surviving female of the Tsalala pride will fall pregnant as a result. 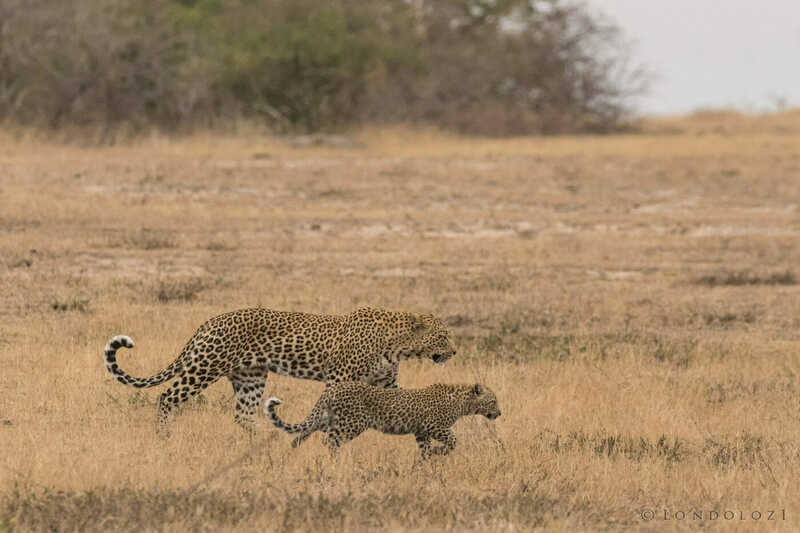 There has been no shortage of leopard sightings in the reserve this past week but my favourite sighting by far was a morning with the Nkoveni female and her cub. 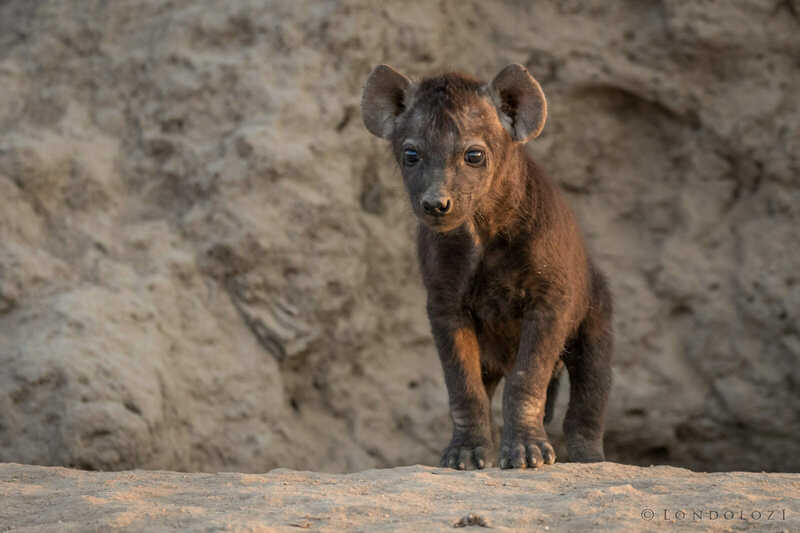 This previously nervous cub is now completely relaxed in the presence of our game viewers and the two of them together provide for some wonderful viewing. The Kaxane male has also been seen a number of times this last week in the open areas of the south-western parts of the reserve. This male is 13 years old now and won’t likely be a threat to any of the other males in the region because of his old age. Having heard stories of this male from a number of different people all over the Sabi Sand Reserve I just felt fortunate to see him for the first time. 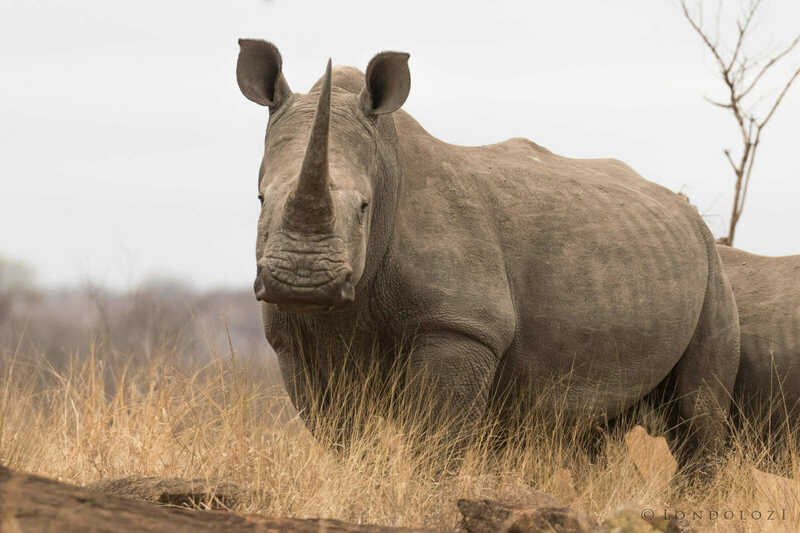 A female White Rhino notices us watching her as she moved over a very rocky ridge in the northern parts of the reserve. Usually favouring the flat open grassland areas it was a beautiful sight to see this crash of rhino’s awkwardly making their way up this rocky outcrop whilst grazing. 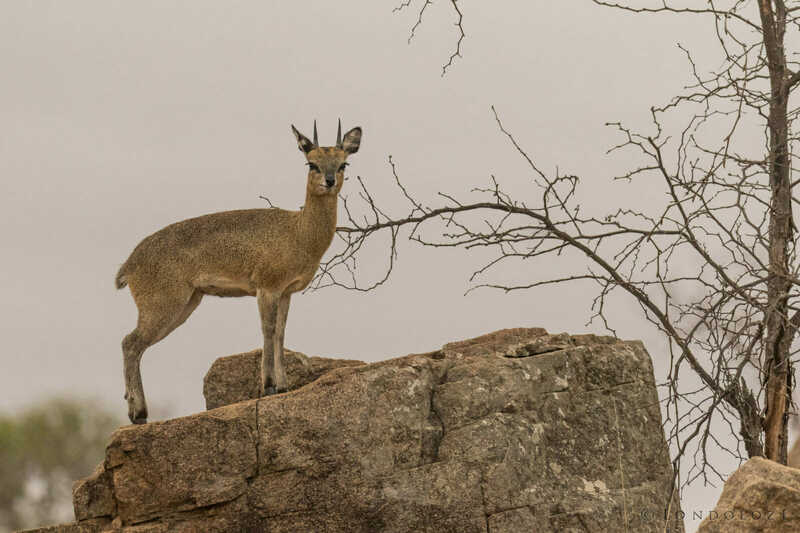 The rocky outcrops on the reserve are home to a few of these Klipspringers and I always marvel at how effortlessly they jump from rock to rock without stumbling. They walk on the tips of their hooves which have long, narrow soles and blunt rounded tips which is perfectly suited for scrambling over rocks in their niche habitat. The Nkoveni female and her cub stroll across an open clearing near the airstrip. With her territory being right around the lodges we have been spoilt with some great sightings of them this past week. With waterholes and the river drying up rather quickly as we still await the first rains sightings of hippos out the water during the day are quite frequent. We saw this bull quite far from any water one morning and assumed he had been kicked out of one of the other busy waterholes by another dominant bull because of some fresh battle scars that he was sporting. 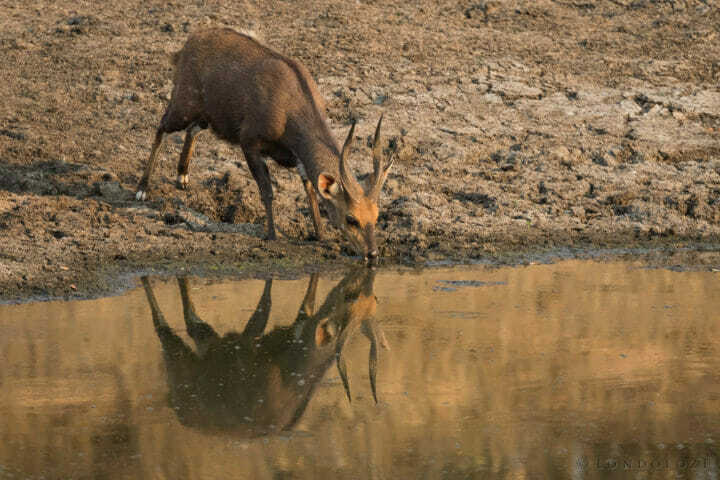 A male bushbuck very gingerly made his way across the mud of Taylor’s Dam to reach this pool of water to drink. 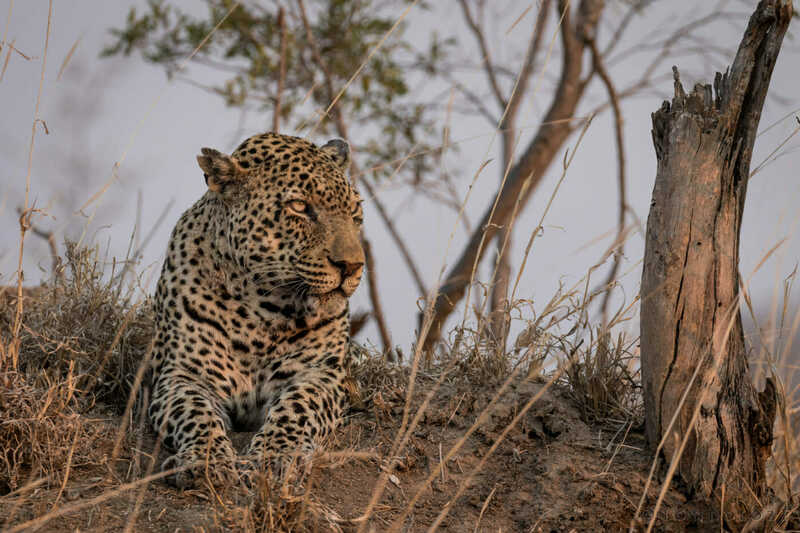 This was the first time that I had seen the Kaxane male, a male leopard that is well known across the Sabi Sand Reserve. 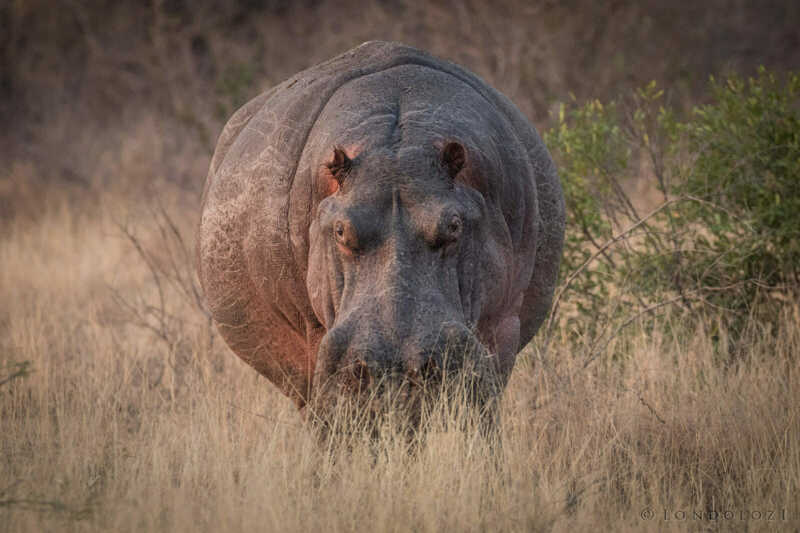 One can’t help but wonder if he will see out his years in the open areas of the south western parts of Londolozi, where he has been found over the last few days. One thing for sure is he still looks rather regal in his old age. With 7 cubs in the hyena den it is a great place to sit and watch the playful antics of these youngsters. This one is still under 3 months of age as the characteristic spots are yet to show through its brown coat. 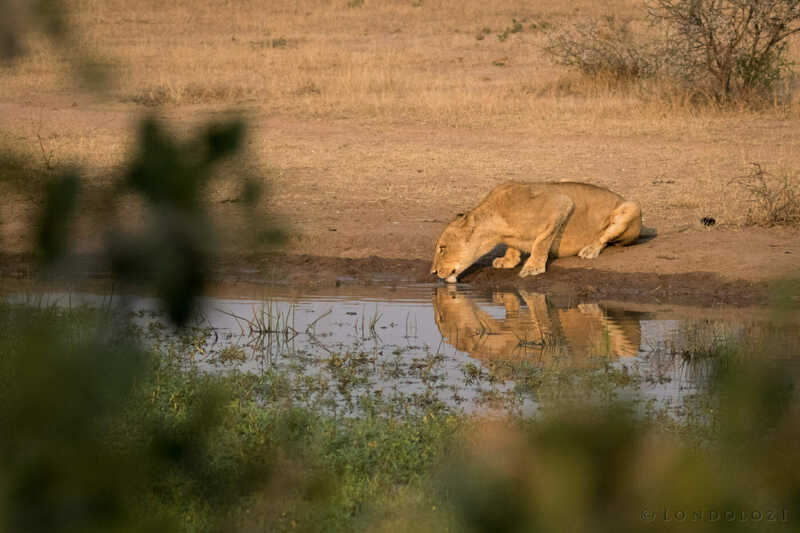 One of my favourite sightings of the week was finding two of the Birmingham Male lions lying in the sand in the middle of the Sand River. The Nkoveni female and her cub spent the better part of an hour playing and grooming each other on top of a termite mound in the middle of this Tamboti thicket. 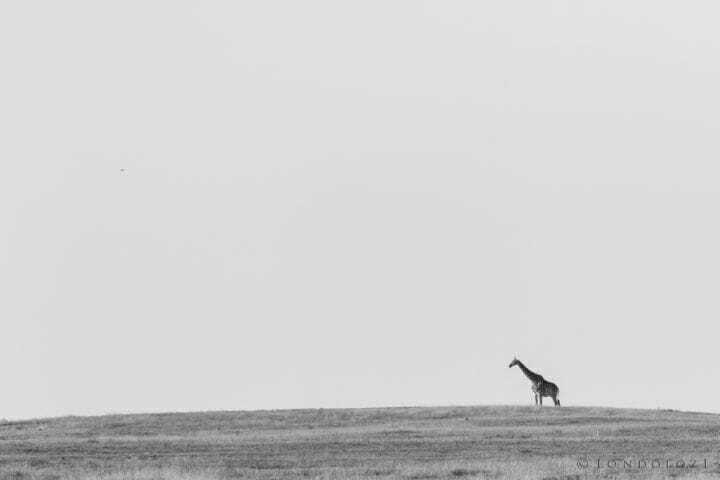 The surrounding grassland around the airstrip made this picture possible and luckily we were in the right place at the right time as this giraffe decided to walk perfectly across the skyline. 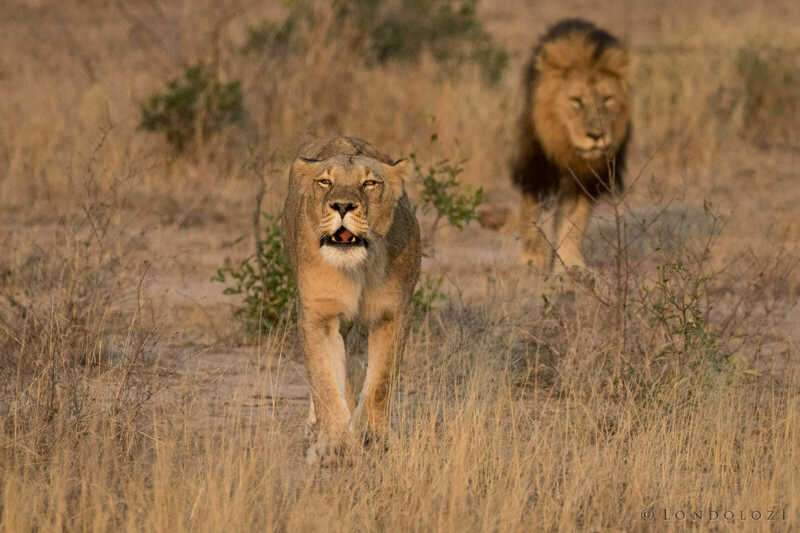 An Ntsevu female, roaring out to try and contact the other lionesses in her pride, is pursued by a Birmingham male. 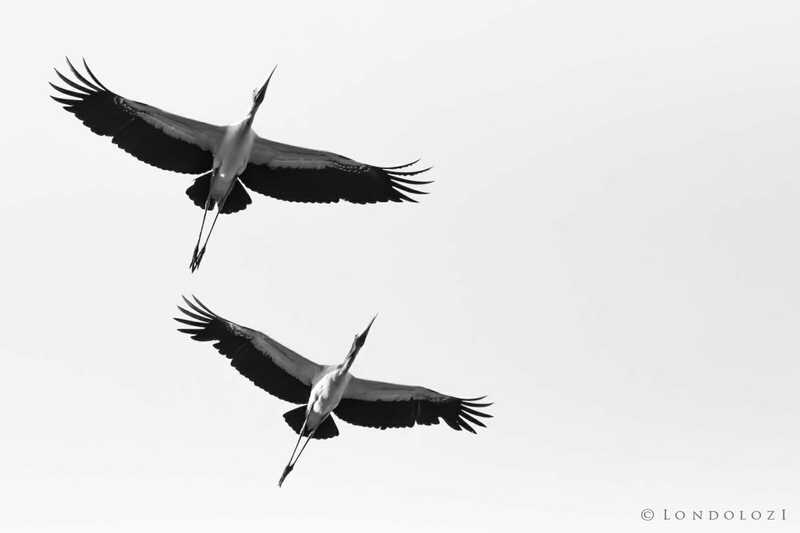 Two yellow-billed Storks soared straight over us as they set off to find another waterhole to fish at. 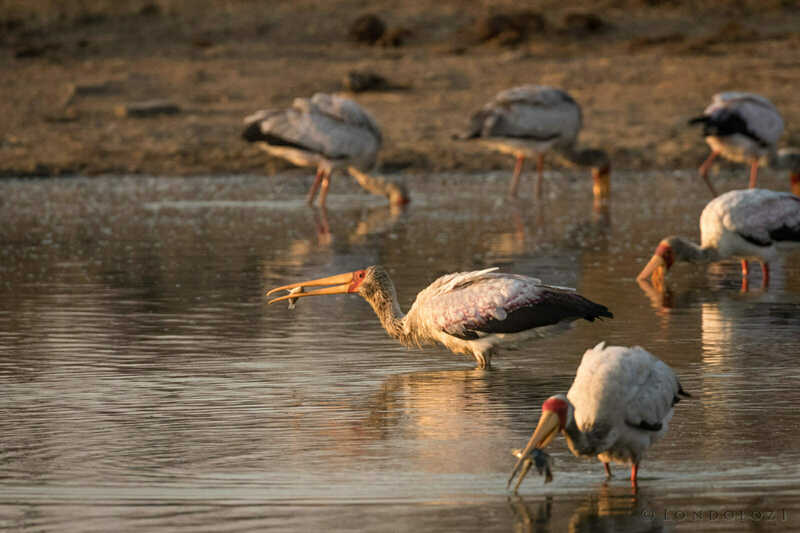 With the waterholes drying up on the reserve it has made them a fantastic hunting ground for a number of different storks who benefit from the abundant number of fish and frogs confined to a smaller area. Case in point from the caption on the above image, not one but two yellow-billed storks catch fish at the same time, while a whole lot more try their luck in the background. An Ntsevu female, reflected in a shallow pan, quenches her thirst early one morning. Stunning pics this week James. Love the Rhino and the Klipspringer. What a great week in pictures! Thanks for sharing! 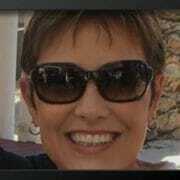 Again beautiful pictures James ! Another great week of images, moving from the cute/sweet Nkoveni mom and cub to the beautiful portrait of the white rhino. I’m really looking forward to beginning my adventure there in November. It will be a very happy Thanksgiving for sure. We’re you using aperture priority and manual iso settings? Hope it cools down for all of you!! Wonderful images, James! I especially enjoyed the intimate moment between Nkoveni and her cub. But the flock of feeding storks including two with fish – wonderful! Amazing photos!!! 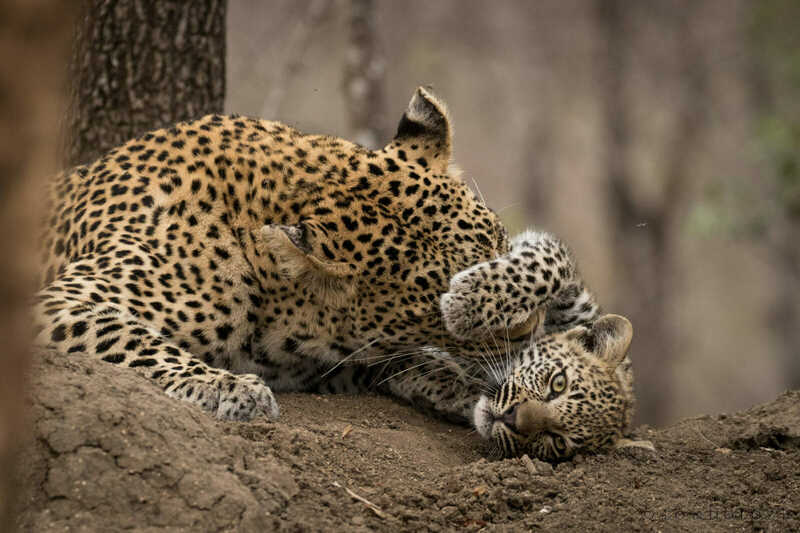 I particulary love the roaring Ntsevu Female and the Nkoveni Female playing with her cub! It seems Londolozi is full of life as is seen the excellent variety of pictures. Well done James in writing a quality blog representing the week. I was very glad to hear that the Tsalala lioness mated with one of the Birmingham males! Perhaps he was the one searching her out last week. I hope this changes her future for the better. But by far my favorite images were of the Nkoveni female with her cub. Who can resist that sweetness!